It’s Tuesday, which means it’s time to unveil our second annual Division III college hoops poll. Here are our Top-5 teams for various Men and Women’s squads from Massachusetts, enjoy. 1.) Amherst College (2-0) (Last Week/No. 2) – The Lord Jeffs leapfrogged to the top spot in our poll after two convincing wins last week against Plymouth State and Washington & Lee. They’ll look to push their current winning streak to three games on Tuesday at Western New England. Willy Workman and Aaron Toomey currently lead the squad with points, while Peter Kaasila has recorded 13 rebounds in two games. 2.) MIT (3-0) (Last Week/No. 3) – The Engineers enjoyed a great win against Rensselaer on Saturday and will look to keep their winning streak going against Endicott College and Suffolk University this week. 3.) Williams College (1-1) (Last Week/No. 1) – After defeating Southern Vermont, the Ephs dropped their first contest of the season against Salem State on Saturday, and of course, dropped two spots in our poll. Wins against MCLA and Wesleyan will help Williams rebound, and get back on track. 4.) WPI (2-0) (Last Week/No. 5) – Replacing Jeffery Robinson was the biggest question for the Engineers, but against Husson and Castleton State, WPI performed quite well, as they earned two significant wins. The Engineers will return to their home court for a critical contest on Tuesday against Elms College. 5.) Babson College (4-0) (Last Week/Not Ranked) – The Beavers won four games they were supposed to win, but now the question is can they keep their momentum going? Most likely, Babson should finish the month of November undefeated, as well as pick up wins against Curry College and Lasell. 1.) Amherst College (2-0) (Last Week/No. 1) – The Lord Jeffs stayed put, as they manhandled Norwich and Saint Lawrence this past weekend by a combined score of 183-101. Amherst should increase its win total to three games on Tuesday evening when they travel to Mount Holyoke before a quick Thanksgiving break. 2.) Williams College (2-0) (Last Week/No. 3) – Handing Babson their first regular loss since January of 2010 was a huge boost for the Ephs, who jumped one spot in our weekly poll. Williams contained Whitman, but now faces a challenging western Massachusetts foe on Tuesday against Springfield College, who’s currently [2-1]. 3.) Babson College (3-1)(Last Week/No. 2) – Beating Brandies and Tufts were necessary, but losing to Williams College was shocking. The Beavers should certainly bounce back against a few NEWMAC foes over the course of the next few weeks before facing University of Wisconsin-Stout at the Southern Maine Tournament. 4.) WPI (2-1) (Last Week/No. 4) – Despite dropping their first official contest of the season against Brandies, the Engineers rebounded with two back-to-back wins against Anna Maria and Worcester State. The Engineers will look to keep their winning ways going against Connecticut College, Rhode Island College and Babson College. 5.) Smith College (3-0) (Last Week/Not Ranked) – The Pioneers have done quite well outside the conference, and can add another victory to their win total against Elms College on Tuesday. Wins against Mount Holyoke and Wheaton College will also help them keep pace with Babson and WPI in the conference standings. WORCESTER, MA – What exactly makes March Madness so enticing and leaving fans wanting more? Could it be the last minute heroics or possibly a game winning shot? How about two great teams battling it out on a historic court in Worcester, Massachusetts? Well, take all of those questions and apply it to an exciting game on Friday, where fans witnessed Worcester Polytechnic Institute (WPI) senior guard, Jeffery Robinson, launch possibly the biggest shot in his college career with 14.5-seconds remaining in the game that secured the Engineers an impressive 57-56 victory against Bridgewater State University during the opening round of the Men’s Division III NCAA tournament. Not only is this particular win special, but it allows the WPI championship dreams to continue another day. “It is just great to see things culminate in a positive way for Jeff Robinson. The kid has struggled over the last month really and for him to hit a shot like that in a NCAA game is just a great feeling for him and everybody,” said WPI head coach Chris Bartley. The game began at a rather fast pace, almost too fast, as both WPI and Bridgewater State attacked each others defense by launching shot after shot. The Engineers eventually took a small lead, thanks to an early foul, which sent Robinson to the line, but eventually, the Bears responded and took the lead for a majority of the first half. Yet, the lead slowly started going back and fourth due to turnovers, as both squads tallied 25-turnovers during the opening 20-minutes. “Obviously turnovers were the story of the game, I think for both teams. The thing I would say is what we were able to do [was] defend them, keep them under 40 percent [from the field], keep them at 57-points, they average about 83-84-points a game and that to me was the bottom line,” said Bartley. However, what made for such an exciting first half was the back and fourth battle between Robinson and Bridgewater State’s senior guard, Judah Jackson, who finished the game with 21-points, three assists, six rebounds and six steals. Jackson kept his team in the game and was completely devastated to see his teams run toward a championship fall short, yet again. Entering the second half, both teams continued to share the lead, but the game slowly turned to shooting foul shots, instead of driving into the paint. Bridgewater State struggled from the line, especially down the stretch, as they converted [8-15] free throws compared to WPI, who finished [16-21]. While the free throws continued to hamper the Bears offense, their defense fell apart during the closing minutes, as they allowed WPI to set up Robinson’s game winning shot. The Bears did however have nearly 10-seconds to win the game, but mishandled the ball and resorted to hulking up a long shot before the buzzer sounded. With the win, WPI will return to comforts of their home court on Saturday, as they will face a very competitive foe, Amherst College at 7:00pm eastern. With a win, Amherst or WPI would then advance to the Sweet Sixteen in the NCAA Division III men’s basketball tournament. Believe it or not, March Madness is set to begin somewhat early, as Worcester Polytechnic Institute will be the host for four Division III NCAA basketball teams on Friday and Saturday, as the road to Final Four in Salem, Virginia is set to begin. Here are just two of the many games that will be occurring this weekend across the country, but between the four schools, WPI, Amherst College, Skidmore College and Bridgewater State University, only one will advance to the Sweet Sixteen. Here is our game-by-game break down, as well as score predictions. Amherst College [22-3] vs. Skidmore College [18-9]: Both schools enter the game with something to prove, yet the Lord Jeffs of Amherst College have to show that they are a legit team, especially after ending their season with a quarterfinals loss to Middlebury College in the NESCAC (New England Small College Athletic Conference) conference tournament. The Lord Jeffs began their season with 21-wins in a row before seesawing to the finish line. However a major reason for their teams success this season belongs to senior guard and co-captain, Connor Meehan, who through 25-games has recorded 330-points and 26-steals, as well as leads the team with 89-assists. Other players to watch on the Amherst side includes Willy Workman, Aaron Toomey and Taylor Barrise, who are all primed for a successful opening round game. As for Skidmore College, they finished their season with five back-to-back wins. They also won the Liberty League for the first time in school history, as well as defeated Hamilton College, 68-52. During the conference championship, the Thoroughbreds shot extremely well from beyond the arc and connected on 16-three pointers. Expect Skidmore to attempt multiple three-pointers against Amherst College, but also, force a variety of turnovers too, which is something the Thoroughbreds have done quite well this season (420 forced turnovers). What the game should come down to is shooting in and outside the paint, building momentum, rebounds, along with shooting the long ball. Skidmore may fall apart against a powerful Lord Jeffs team who has appeared in the tournament quite frequently, so don’t expect an early upset to occur. Bridgewater State University [19-9] vs. WPI [22-5]: Similar to Amherst College, WPI did not win their conference tournament, as they were upset by Massachusetts Institute of Technology (MIT), 63-52. However, WPI dominated their opponents, as well as the NEWMAC (New England Women’s and Men’s Athletics Conference) and finished atop the league standings with a [11-1] record. The Engineers, who were led by senior guard, Jeffery Robinson and junior center, Matt Carr, combined for 757-points, 56-steals, 49-blocks and 268-rebounds. WPI led the conference in scoring defense, as they kept all of their opponents to a total of 1,574-points through 25-games, which may play a factor against a Bridgewater State University team that is used to scoring lots of points. However, WPI struggled immensely from the free-throw line this season, converting on 361-518 attempts, which could play a factor in Friday’s game. Similar to Skidmore College, Bridgewater State University may indeed be the underdog, but a rather competitive one. The Bears finished the month of February with a record of [8-1] and will certainly want to capitalize on their Massachusetts State Collegiate Athletic Conference championship victory against Salem State. The Bears are a team that can certainly stretch the lead, but also, gain momentum quickly. Against the Salem State Vikings, the Bears went on a 15-0 run to remain in contention in the second half, as well as connected on a majority of their free throws. Hitting clutch shots at the line will be pivotal against the Engineers, especially during the closing minutes of the second half. All in all, this particular game is set up to be a very equal contest, which should come down to shots in the paints and free throws. If WPI can bounce back to their winning ways, which occurred early this season, as well as limit the Bears senior forward Nicholas Motta, then the Engineers will advance to the next round. However, if the Bears can force the Engineers to take quick shots, limit their chances on the board, as well as force turnovers, well then, expect Bridgewater State to move on. 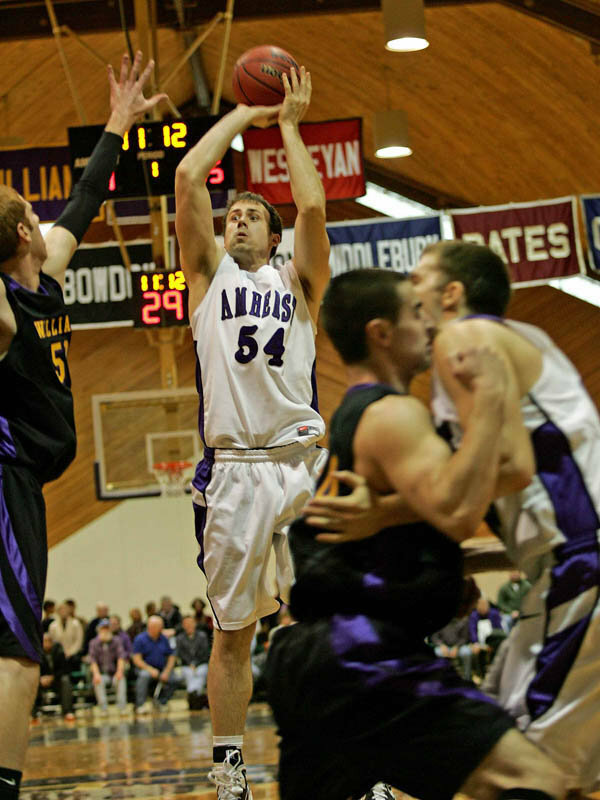 Saturday’s Second Round Match Up Prediction, (Amherst College vs. WPI): What a game this will be. Two powerful offenses and defenses, which will surely score points, but once the game is over, expect the Lord Jeffs to earn an important victory, as well as advance to the Sweet Sixteen. Amherst College is too powerful of a team to let their NCAA championship dreams fail this weekend, so expect them to get by Skidmore easily, but be challenged against a well rounded WPI squad.